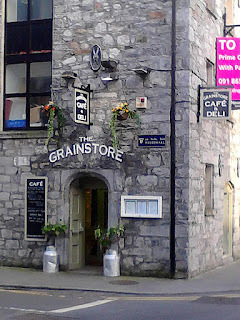 This cafe / deli is in the old Grain Store building, on the corner of Abbeygate St and Whitehall, near the back entrance to the Eyre Square shopping centre. Self-serve downstairs, and table-service upstairs, the cafe is open from 8am weekdays, and offering brunch from 10am - 5pm on Sundays. The menu includes gluten free bread/scones.